Pets, people (young and old and in between), homes. Still life. Florals. Abstract compositions. I am willing to include your objects as subjects — vases, tablecloths, family heirlooms, dolls, cars, motorcycles, etc. I enjoy painting fabrics with patterns, reflective and transparent surfaces found in glass, silver and chrome. I incorporate those same elements to create abstract compositions. I am willing to use a palette that will suit your environment. Right now my graphite drawings of pets are $350 and people are $475, matted and framed. 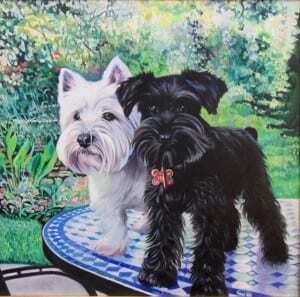 Prices for oils and colored pencil renderings start at $400 (one pet) and $650 (one person) and go up based upon size, the number of subjects, if they are pets or people, and the amount of intricate details. I am willing to customize the dimensions to fit your space requirements. Contact me by email or phone for more precise information based upon your needs. 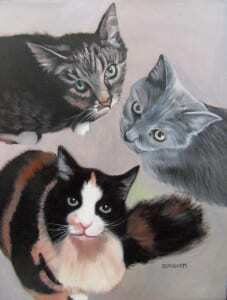 If you are thinking of a commissioned piece of work for a specific date please allow enough time. Oils require additional time to create and to dry. Keep in mind that around the holidays, I tend to get busy and can only do a limited number of commissions. A contract and deposit apply. I am happy to consider using your snapshots as references for paintings. I am open to suggestions including combining photos and changing and creating new backgrounds. My wish is to collaborate your ideas into my artwork; however, I maintain control over artistic decisions. I do not accept all commissions. Personalized gift certificates and gift cards are available. Call for an appointment since my days and hours in the studio vary. I am very willing to accommodate your schedule. 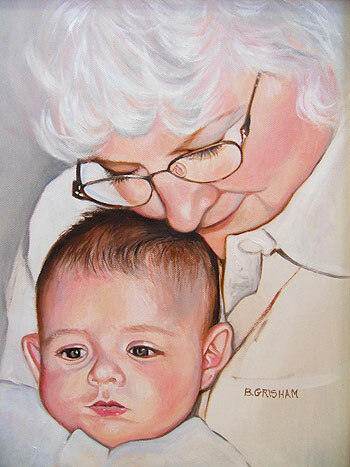 Visit my other pages on this site and my personal website at www.bettygrishamstudio.com for more examples of my work.